Good morning, good morning! 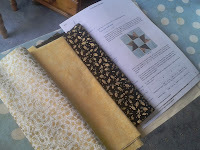 It's another hot steamy one here in the English Midlands, and the second day of the July edition of the Christmas QAL! I'm just checking that everyone who is playing along either with Christmas projects of their own, or taking up QuiltSue's fiendish Challenge have signed up to Mr Linky on the QAL page above? I hope so, so that we can all come a-calling and see what you're up to! So what does today bring? Well, for one, I want to finish my candle block that I started yesterday, and I might do some cutting for the two star blocks I have planned too. I found a really helpful free tutorial for the block in the size I want here, at Arbee Designs. Also, I'm out of biscuits, so I need to do a little baking - with a Christmas theme of course! Perhaps you will want to make some with me? I'm still in two minds whether to go for the egg nog that I was talking about last night - I have all the ingredients in for Joanna's Betty Crocker recipe, but it still sounds vile! Does any (apart from Donna's Dad and Sunny's BH) like it? In the interests of research I may have to go for it - we'll see how brave I am later! Right - let's get on! Similes? Synonyms? No - I've got it - ALLITERATION. I agree with you - my baking will be oven based, not hob based! Went to check on the 'softened butter' that I took out the fridge - it's very 'softened' indeed!! Does making jam which MIGHT (if I can bear to part with it) become Christmas presents count as participation in the QAL .... perhaps if I cut pretty fabric circles to put over the lids of the jars? Hmm - doesn't count (unless you send me some, of course!). You're not really jam making in this heat, are you?? Not actually making the jam, have just prepped all the fruit and left it to soak up the sugar until tomorrow morning (Delia method). If I could remember to take a carton to the Hill to put them in (as opposed to stuffing pounds of them down my greedy neck), I could make jam too! I like the fabrics you have chosen for your star. I purchase my egg nog in a carton and am lucky to finish it. Not many of my family drink it. This egg nog hasn't exactly been given a resounding cheer, has it? Hmm. As I don't drink Hazel, I'd dismiss the idea.Maybe something more summery in the heat you are having. I thinkI'm tired and making mistakes, so I'll leave it at that. I did a small post too. I could do a 'virgin' one without the brandy - but frankly that's the one ingredient that make the whole thing bearable!! Hope you're enjoying your family time - take it easy! No baking in this house today! It is another hot one so we bought some lobster to have for supper. i don't plan to heat up this kitchen. 34 years ago today we got married...he is outside trimming bushes in the heat and I am sewing Nostalgic Christmas blocks in my basement corner...gotta love this man! Wonderful, Lesley - and congrats! Like the idea of lobster for supper! I have shepherd's pie (not very summery!) and home grown peas, baby broad beans (fava beans) and courgettes (zucchini) for supper this evening.